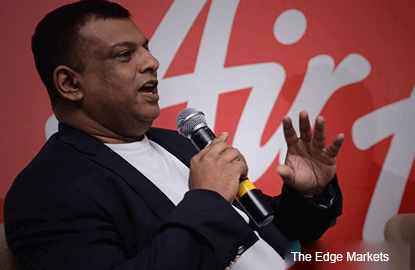 KUALA LUMPUR (June 28): AirAsia Bhd group chief executive officer (CEO) Tan Sri Tony Fernandes will be meeting Transport Minister Datuk Seri Liow Tiong Lai tomorrow to discuss the klia2 branding issue, said a Bernama report. "We understand that we do not have the right to rename the terminal, but we still want to push this as a marketing strategy to tell the world that the terminal is low-cost," Fernandes told reporters at the Malaysia [email protected] event today. AirAsia wants klia2 to be renamed LCCT2 after it announced plans for a campaign promoting the low-cost carrier terminal in Sepang. Its CEO Aireen Omar reportedly said AirAsia currently occupies 97% of operations at klia2. Last week, Liow was quoted as saying that the name change was not practical or necessary. "Names should not be changed for the sake of changing." Fernandes also urged Malaysia Airports Holdings Bhd (MAHB) to work together with AirAsia in attracting more travellers to use klia2 as a connecting terminal, saying this would translate into more jobs and tourism receipts. He said klia2 lacks integration with the main terminal Kuala Lumpur International Airport given the absence of airside transportation, with its only form of connectivity being the ERL service, which charges RM2. "It is the only airport in the world that charges you to move from terminals. That does not help with integration. "We brought up this issue after two years (of klia2 starting operations) because before this, we never had any connecting product and this segment is now growing rapidly," he said in the Bernama report.